GOLDEN VALLEY, Minn. (KARE 11) — Rejoice, Midwesterners everywhere! The Farmer’s Almanac has released its 2019 winter weather forecast, and it’s calling for “above-normal temperatures” in most places in the U.S. The almanac labels Minnesota and North Dakota as warm and dry, with just the very bottom of Minnesota as warm and wet. Northern Wisconsin is also expected to be warm and dry, with southern Wisconsin registering as warm and wet. 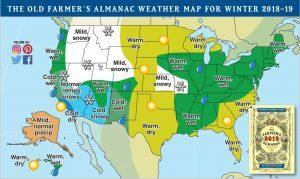 “Our milder-than-normal forecast is due to a decrease in solar activity and the expected arrival of a weak El Niño, which will prevent cold air masses from lingering in the North,” the Farmer’s Almanac reads. In Minnesota, North Dakota and Wisconsin, specifically, October and November are expected to be milder and drier than usual, with the coldest temperatures in early to mid-December, late December into January, and late January into February. The snowiest times will be mid- and late November, early and mid-December, and early and late March, according to the long-range forecast. Will the Old Farmer’s Almanac prove true this year? Only time will tell.